Our Gold Coast Branch has recently completed the renovation of a large architect designed home situated in the Gold Coast hinterland. The scope of the renovation focused on improving the use of natural light while also creating warmer, more appealing living and entertaining spaces. The hinterland region has a mild climate in summer, and can get quite cold in winter. With this in mind, Solect® Clear laminated glass was specified on certain elevations. The Solect range of glass products offer high performance qualities in both solar control and light transmission. Large fixed windows were installed to maximise the amount of natural light allowed into the home. 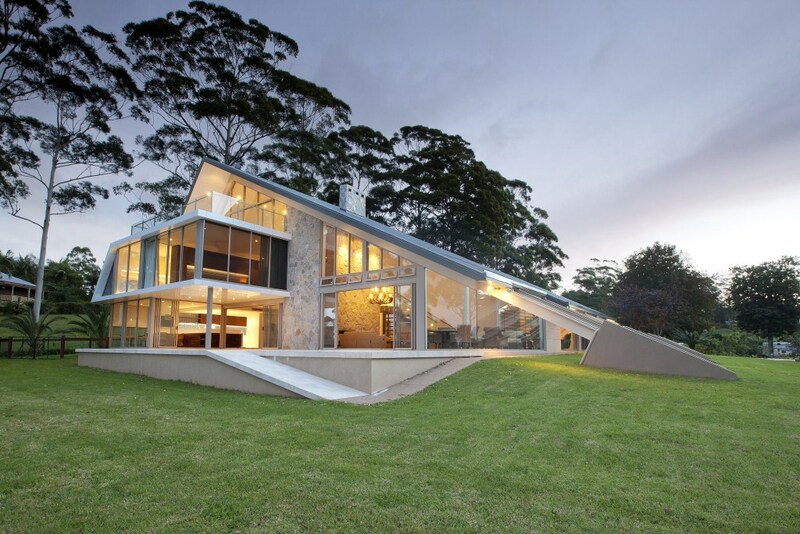 The unusual shape of the building required custom framing to accomodate the rake of the roof. Frameless Glass balustrading was used on the staircase, and clear laminated glass flooring on the upper landing to further aid the spread of light throughout the home. Sliding doors were used to expand the living space of the home outside in good conditions, with awning windows above to allow for additional ventilation. This stunning renovation has gained well deserved recognition from industry bodies having received the 2012 Glass & Aluminium Association of Queensland Award for the Best Use of Glass & Glazing – Residential and, more recently, the Australian Window Association’s 2012 award for the Best Use of Windows & Doors in a Residential Renovation. The Architect responsible for the design of this major makeover was Paul Uhlmann, and the project was managed by Graeme Cameron Constructions. The windows, doors and specialised glazing was supplied by the team at G.James Gold Coast. G.James has the product range and experience to ensure your next project is an outstanding success. To find out more please contact your nearest branch. This entry was posted in Doors, Residential, Windows and tagged Natural Light, Renovation. Bookmark the permalink.